Buy Taifun Organic Vegan Basilico Tofu - 200g in the UK from our online shop or directly from our independent Scottish store. This savoury basil flavoured tofu is commonly used in hot and cold Mediterranean dishes. October is a great month for eating cabbages. Most cabbages can be eaten raw, steamed or boiled. This recipe is a healthy way of trying red cabbage raw. This recipe contains Basil Tofu. This pasta dish uses green ingredients, like spinach pasta, basil tofu and garden peas. You can also use purslane instead of rocket leaves! This recipe contains Basil Tofu, cubed. We sell real Taifun and other Meat Replacements directly from our shop in Scotland and online throughout the UK. View more products from Taifun. Where can you buy real Taifun Basil Tofu safely online? 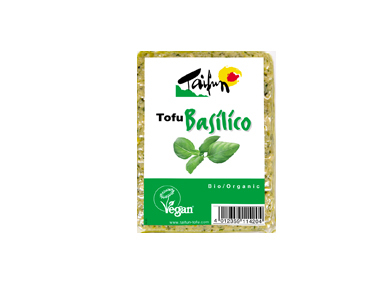 If you are wondering where you can buy Taifun Organic Vegan Basilico Tofu - 200g safely online in the UK, then shop with us.